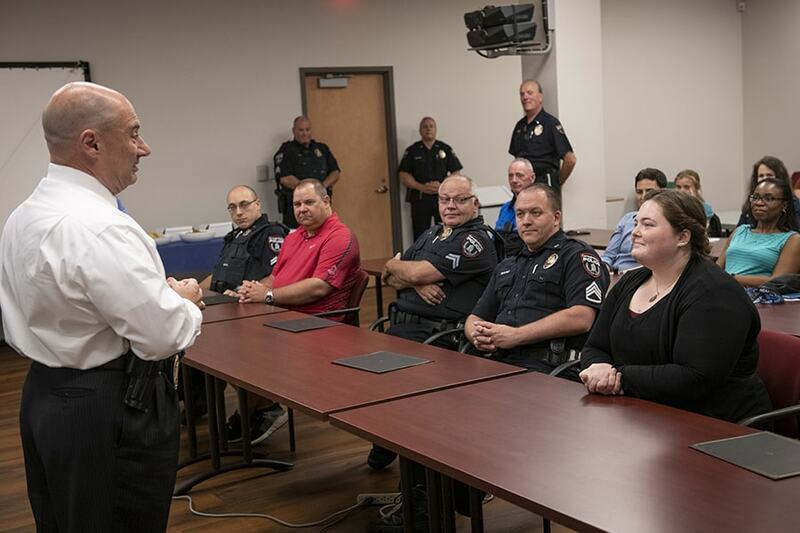 Carnegie Mellon University’s Police Department hosted a ceremony last week honoring five of its officers and a university staff member for their involvement in two recent life-saving efforts in the community. Gabriele Crytser, a research assistant in CMU’s Department of Mechanical Engineering, was walking along the Schenley Bridge on her way to work when she encountered a University of Pittsburgh student on the other side of the railing preparing to jump. “I just walked over to him and said ‘hi,’ and I asked him how he was. We had a conversation about school and life and his family. And then at some point, I asked him if he wanted to continue the conversation on the other side because it was making me a bit nervous,” Crytser said. She persuaded the student to walk with her to Scaife Hall, where she used an emergency call box to contact CMU Police. They arrived within minutes. 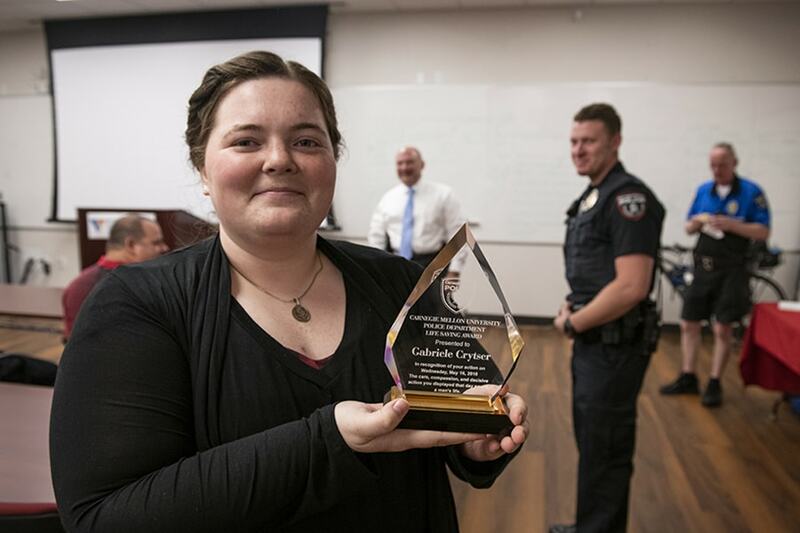 While honored and humbled to receive her Life-Saving Award, Crytser said she truly feels it was a team effort, and gave a lot of the credit to the young man she helped save. CMU Police Chief Tom Ogden praised Crytser for how she handled herself and the situation. Also honored at the ceremony were CMU Police Sergeant Nello Bruno, Security Officer David Marchwinski, and police officers Michael Ufheil, Jeffrey Varchetto and Donald Campbell for reviving an individual who went into cardiac arrest earlier this year. Campbell, who announced he will retire in December after serving the CMU community for 34 years, said it’s common for many people to be involved in that type of situation. The family of the young man Crytser helped rescue from the bridge later contacted CMU Police asking if they could meet with her. CMU Police Lieutenant Joseph Meyers is organizing the gathering during which the family members, who reside several hundred miles from Pittsburgh, will get to express their gratitude to Crytser in person. Chief Tom Ogden welcomes guests at a CMU Police awards ceremony honoring (front row, l-r) Michael Ufheil, David Marchwinski, Jeffrey Varchetto, Nello Bruno, Gabriele Crytser and Donald Campbell (not pictured). 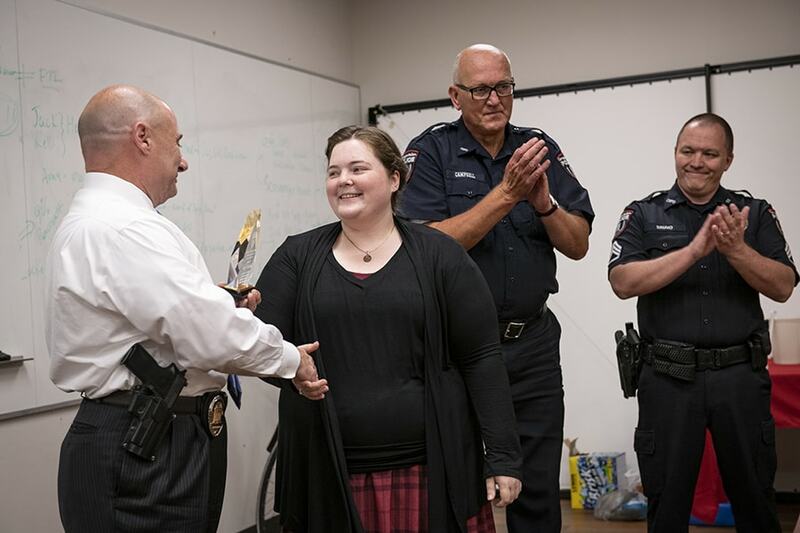 Crytser receives a Life-Saving Award from CMU Police for her extraordinary actions during a recent crisis. 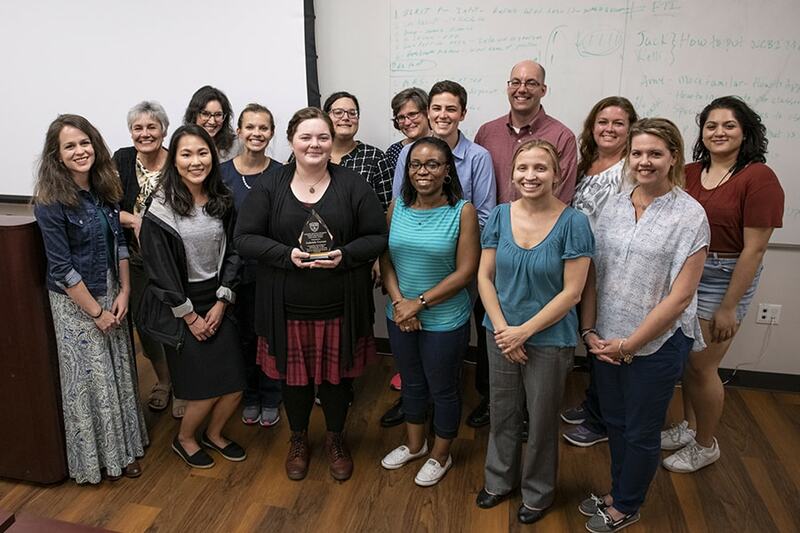 Crytser's co-workers from the Department of Mechanical Engineering pose with her for a photo after the awards ceremony. 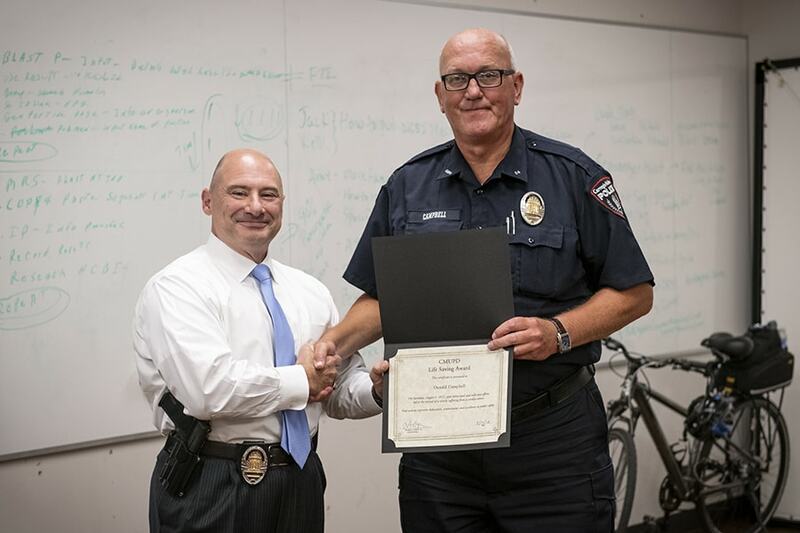 Chief Ogden presents Officer Donald Campbell with an award for his recent life-saving efforts. Campbell announced he will retire in December after having served the CMU community for 34 years.